Over the past several months you may have heard Nalini Ambady’s story. The Stanford professor and mother of two high schoolers who had a relapse of acute myelogenus leukemia (AML) in November 2012. She was in urgent need of a match and so the search began. Family, friends, collegues and students started organizing drives around the country. 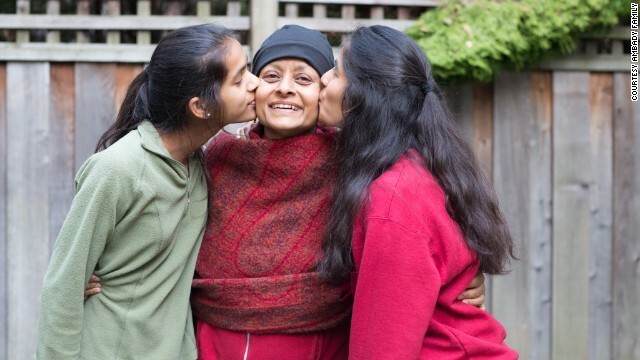 On December 27, Nalini and her family received a belated but incredible Christmas present — Mom’s doctors had found 12 potential bone marrow matches! The drives stopped, and we breathed a sigh of relief. However, it didn’t occur to them that none of the 12 potential matches would work out, or that people would back out of donating their bone marrow. So they were shocked when they got the heartbreaking news that half of the potential donors had refused to follow up. The other six did, but were ruled out upon further testing. Their spirits were crushed. So, the search began again. They created a Facebook campaign and held more than 150 drives in the US. It’s been a long eight months for the Ambady family and a roller coaster of emotions that most of us can’t even fathom. But after all this, their prayers have been answered. On July 9th the family shared that they have found a match that is willing and able to proceed as a donor. Nalini will be having her bone marrow transplant at the end of the summer. To the Ambady family…our hearts go out to you for the heartbreak you’ve felt a few times over due to fear and ignorance. Your story gives hope to other patients and their family. Congratulations on finding your “perfect” match and we pray for Nalini to have a successful transplant and recovery. This entry was posted on July 17, 2013 by youcanmakemestronger in Story and tagged #nalini, nalini ambady, stanford professor.